← Why is register_globals = On a security risk? After collecting historical data on retirement and life expectancy over the past 50 years, I was shocked to see the results. In 1950, life expectancy in the United States was not quite 69 years, and the average age of retirement was about 67, which meant that the expected period of retirement was a mere 1.6 years. As of 2005, the average life expectancy was almost 78 years, but the average age of retirement had dropped to about 62, which led to an expected period of retirement of 15.9 years–and that period is growing. For the first time in history, a large portion of the population is facing a significant retirement period during which it will be trying to live off the wealth it accumulated during its working years. Who will produce the goods for workers and retirees to consume? Who will buy the assets that the retirees will have to sell? A large part of the answer to both questions, he maintains, is residents of developing countries. 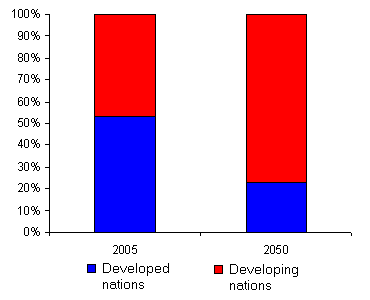 Assuming that the present growth patterns in developing countries continue, the share of the world’s GDP produced in developing countries will rise from 47% today to 77% in 2050. 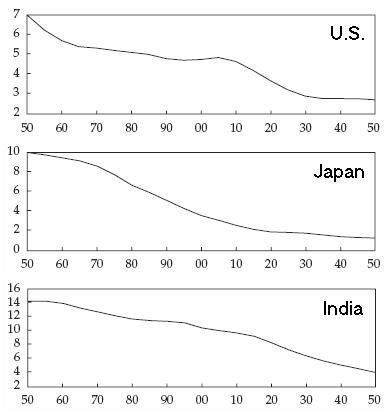 Population aging in developing countries, while present, won’t be as acute as it is in developed countries (India, for example, currently has about 10 workers per retiree and is expected to have about four in 2050). If growth should drop to zero in the developing world, the retirement age in the United States would have to rise to nearly 76 years. If growth occurs at 2 percent, the retirement age will still have to rise but only to about 72. With growth of 4 percent or more, a retirement period of 15 years or more becomes possible again. At 4 percent growth or higher–and this includes Africa and the Middle East along with Asia and South America–the United States will not have to worry about the age wave; there will be enough goods for retirees and enough buyers for their assets. This entry was posted in Economics, Finance and Investments. Bookmark the permalink.